Don't blow it or it could cost you! Please, leave the fireworks to the pros. Be aware of the fireworks ordinance. The Sheboygan Police Department will begin a period of strict enforcement of the City of Sheboygan's fireworks ordinance effective immediately. The illegal discharge of fireworks within city limits can pose significant risk of personal injury, fire and disturbing the peace and tranquility of neighborhoods. Prohibited fireworks will be seized and violators will face substantial forfeitures. City ordinance 50-696 to 50-698 describes fireworks as follows: Fireworks means anything manufactured, processed or packaged for exploding, emitting sparks or combustion, which does not have another common use. Additionally, no person may sell, possess, use or discharge any fireworks within the city, except those that are specifically approved by the common council, and conducted by or on behalf of the city. 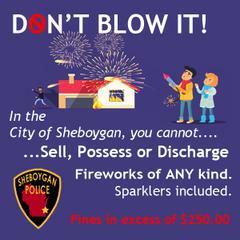 Fireworks are prohibited to possess and use in the City of Sheboygan, regardless if they were purchased and possessed legally in other parts of the state. Violators will face forfeitures in excess of $250 per violation. Parents or legal guardians of a minor who consent to the use of fireworks by the minor will also face similar forfeitures. Additionally, discharging fireworks in a crowded area may result in violations of the criminal code. The Sheboygan Police Department wishes for all residents and visitors to the city to have a safe and enjoyable summer season.